Taking public transport, including the Moluwe and Danfo buses, may be the cheap option of transportation in Lagos, but it is not free. A fare is usually required and it is important you ensure you have enough cash to settle the transport fee before jumping on the bus. While it might be tempting to skip your bus fare, either because you think the conductor will not notice or you believe you can come up with a story touching enough to make them waive the fare, don’t do it. The public embarrassment and possible physical harm will not be worth it. Some fare-jumpers have found themselves spending quality time at the hospital, treating wounds inflicted on them for trying to play hooky. While most Lagosians are nice and helpful there are always folks looking to take advantage of unsuspecting tourists (and locals!). Never place your wallet in your back pocket, as you are bound to lose it – sometimes without even knowing. Be smart, use common sense and keep an eye on your wallet is, particularly when you’re in crowded places such as Obalande, Oshodi and Balogun market. Whether it’s when paying for things on the street, counting your money or taking out a wad of cash and then asking the waiter how to figure out the bill, flashing cash is never a good move in Lagos. The Nigerian currency is not hard to figure out. Always keep a running tally in your head so you do not have to whip out your cash and start counting; this will also protect you from thieves. 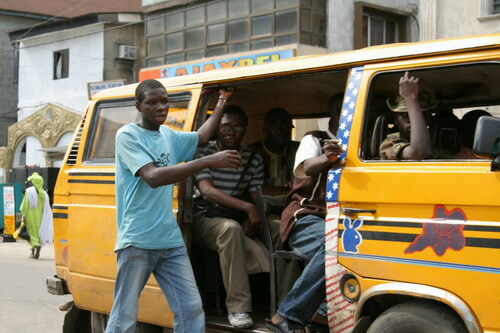 With so many amazing things to do in Lagos, sooner or later you are going to have to wait in a line. Whether you’re queuing up to snag rush movie tickets, trying to grab a meal at a popular eatery or waiting to use an ATM in a shopping mall, you are going to have to wait along with everyone else. If you stealthily try to make it to the front, you will be caught and blessed with the wrath of a crowd of scary, impatient Lagosians…and this is not something you want to deal with. may not end up buying. it, you better be prepared to pay for a portion, even if it is as small as NGN50 worth. Most street vendors will reign insults and curses on you, while some other will take a step further and cause an embarrassing scene if you refuse to make a purchase. of stressed and tired commuters. If you are looking to buy anything from a hawker, never give them the cash before you receive the item as there is a huge chance they will disappear with your cash and the item. Also, if they need to give you some change after purchase, do not hand them the cash. Instead, ask them to return with the change you need before you make the purchase. the more enjoyable your stay will be.